Copper Beach is in stores on January 10, 2012. I’ve had my preorder in on Copper Beach for a couple of months now, since my birthday when I used a gift card to stock up on upcoming favorites. Since I’m a total fan of Jayne Ann Krentz (I think even her bad stuff is better than most other authors’ good stuff, LOL), I’ve been waiting for this since In Too Deep, which is now finally available in paperback. Now’s the time to start keeping an eye our for a bargain priced hardback for that one too. 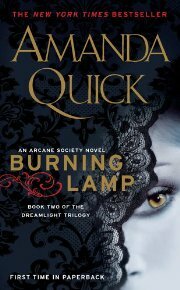 After this book, JAK will be releasing Crystal Gardens (Ladies of Lantern Street) as Amanda Quick in April 2012. Both are paranormal romance and mystery, and it looks like Arcane Society is finally out of the picture for now. Although I have enjoyed the series, I’m definitely ready for a break from it. I’ll be sure to post about whether or not Copper Beach is a stand-along beginning to another series. The book is being called A Dark Legacy Novel, implying this is the beginning of a series and not identifying itself with any affiliation to Arcane. In January 2012, Jayne Ann Krentz releases another novel of paranormal romance, the first book of the Dark Legacy series, Copper Beach. A rare book. An ancient code. Within the pages of some centuries old, very rare books lie the secrets of the paranormal. Abby Radwell’s unusual psychic talent has made her an expert in such volumes while sometimes taking her into dangerous territory. After a deadly incident in the private library of an obsessive collector, Abby receives a blackmail threat. Rumors swirl that an old alchemical text known as The Key has reappeared on the black market. Convinced that she needs an investigator who can also play bodyguard, Abby hires Sam Coppersmith, a specialist in paranormal crystals and amber "hot rocks." Passion flares immediately between them, but neither entirely trusts the other. When it comes to dealing with a killer who has paranormal abilities and a blackmailer who will stop at nothing to obtain an ancient alchemical code, no one is safe. Copper Beach is available as a hardback novel, an audiobook CD, and a Kindle ebook from Amazon. I can’t yet tell if this is part of the Arcane Society but this is the start of the new Dark Legacy series. Considering the book description mentions amber "hot rocks" and the Harmony books make frequent use of amber, I believe this new series is somehow tied in to the rest. In Too Deep (Jayne Ann Krentz) begins another trilogy within a series as part of the Arcane Society series from Krentz/Quick/Castle. Featuring Fallon Jones and Isabella Valdez, In Too Deep finally gives us a story about the much mentioned Fallon Jones from previous Arcane Society novels. Isabella is likeable and fun, while Fallon is a strong, intense man who runs the Jones & Jones agency with strategic focus. Isabella is a good foil for Fallon’s more sober, methodical personality. I enjoyed the mystery and romance in this one. The paranormal aspects were interesting too, but although the psychic nature of the characters of In Too Deep, like in all the Arcane Society books, are essential to the story line, they aren’t my favorite parts. The overly mystical way Krentz writes these parts of the book bog me down in details I don’t really care to know. That’s about the only negative I have to say about the book, and it is definitely a recommended read for anyone who likes Krentz’s style: great dialogue, clever humor, mystery suspense, and romance. The books started off strong and interesting, bringing in characters from previous Arcane Society books in a supporting capacity without overwhelming this story. The end sets up the continuing saga of the Arcane Nightshade conspiracy but that’s something I’ve come to expect from these novels. Although each story ends in a satisfactory way, the ultimate conflict between Nightshade and Arcane continues to fuel more stories in the series. Next Book in the Series: The book is followed by Quicksilver with Jayne Krentz writing as Amanda Quick. Quicksilver looks to be an exciting follow up in the Looking Glass trilogy and I’m anxious to get my hands on the book. 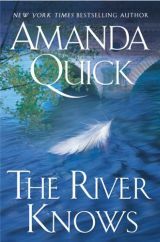 Although I generally don’t buy Jayne Ann Krentz novels in hardcover, I do buy Amanda Quick’s books for my personal library when I find them for sale at a bargain. So, here’s to some bargain hunting in my future as I await my chance to purchase Quicksilver by Amanda Quick in hardcover at a super bargain price. ;-) LOL. 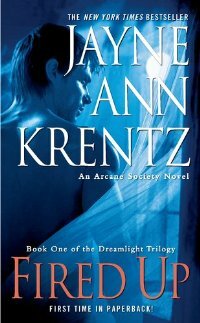 Jayne Ann Krentz’s newest Arcane Society book is available to buy as an audio book from Audible. In Too Deep is book #10 of the Arcane society paranormal romance series. 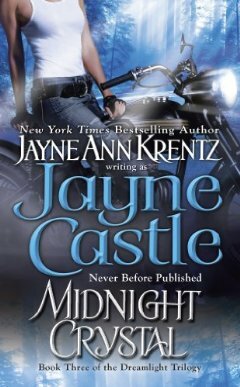 The In Too Deep Jayne Ann Krentz audio book is narrated by Joyce Bean. (She also narrates the Darkfever books from Karen Marie Moning.) This edition of In Too Deep is unabridged and lasts 9 hours and 24 minutes! That’s plenty of time to become engrossed in this lively tale of romance, mystery, and the paranormal. Jayne Ann Krentz follows up her highly successful Dreamlight Trilogy â€“ written in collaboration with her two alter egos, Amanda Quick and Jayne Castle â€“ with a brand-new Arcane Society story arc that begins in a secluded coastal town in northern California. Scargill Cove is the perfect place for Fallon Jones, confirmed recluse and investigator of the paranormal. Itâ€™s a hot spot, a convergence point for unusually strong currents of energy, which might explain why the town attracts misfits and drifters like moths to a flame. Now someone else has been drawn to the Cove â€“ Isabella Valdez, on the run from some very dangerous men. When she starts working as Fallonâ€™s assistant, Isabella impresses him by organizing his pathologically chaotic office â€“ and doesnâ€™t bat an eye at the psychic element of his job. Sheâ€™s a kindred spirit, a sanctuary from a world that considers his talents a form of madness. But after a routine case unearths an antique clock infused with dark energy, Fallon and Isabella are dragged into the secret history of Scargill Cove and forced to fight for their lives, as they unravel a cutthroat conspiracy with roots in the Jones family businessâ€¦and Isabellaâ€™s family tree. The River Knows is a recent favorite. The good thing about historical romance (or period romance) is that it doesn’t age in the same what that novels with contemporary settings do. For that reason, Jayne Krentz’s Amanda Quick historicals have stayed current in a way that her older contemporary romantic suspense hasn’t managed. Therefore, don’t hesitate to get all the old books and read from the earliest Amanda Quick novel to the most recent. Several of her older stories are my absolute favorites. Until recently, most Jayne Ann Krentz and her Amanda Quick novels have been stand alone, but she’s started the Arcane Society series of novels and these share much more in common. They’re still stand alone novels. I prefer JAK’s Amanda Quick novels. They’re much sexier than the contemporary stuff she writes under JAK. Also, I have a page that details some summary information about pseudonyms for Amanda Quick. Ravished (Amanda Quick) is without doubt my all time favorite historical romance novel and I’ve read it an embarrassing number of times since I bought it. 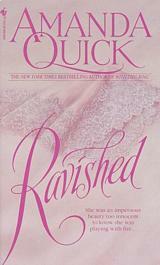 Ravished remains my most beloved Amanda Quick novel. The Beast of Blackthorne Hall is beyond compare, and Harriet is my favorite heroine of all the great Amanda Quick novels. I adored the chemistry between Gideon and Harriet, but I think the thing I liked most about the book was Harriet’s unrelenting faith is Gideon’s goodness and honor. And the opening had to contain my favorite lines of all time. It was a scene straight out of a nightmare. Gideon Westbrook, Viscount St. Justin, stood on the threshold and gazed into the cheerful little anteroom of hell. There were bones everywhere. Savagely grinning skulls, bleached ribs, and shattered femurs were scattered about like so much devil’s garbage. Chunks of stone with teeth and toes and other odd bits embedded in them were stacked on the windowsill. A pile of vertebrae littered the floor in one corner. In the center of the unholy clutter sat a slender figure in a stained apron. A white muslin cap was perched askew atop a wild, tangled mane of chestnut-brown curls. The woman, obviously young, was seated at a heavy mahogany desk. Her slender, graceful back was turned to Gideon. She was sketching busily, her entire attention focused on what appeared to be a long bone embedded in a chunk of stone. From where he was standing, Gideon could see that there was no wedding band on the supple fingers that held the quill. This would be one of the daughters, then, not the widow of the late Reverend Pomeroy. Just what he needed, Gideon thought, another rector’s daughter. Another favorite is Deception , which I recently reread. Olympia and Jared are a fun couple and I loved the pirate themes in the story. It’s also another story where there’s family involved–loving, if misguided family–and I really enjoy stories that have that added depth. The River Knows is my most recent favorite for several reasons. The suspense was neatly done and the hero, Anthony Stalbridge, and heroine, Louisa Bryce, were interesting. I liked that the hero had a loving family–many of Quick’s heroes aren’t that lucky.